25 m2, comfortable, decorated with mountain-style care. Free WIFI individual. Nice studio, divisible, parquet flooring, bright, Residence AMETHYSTE, one of the best located residences, directly on the slopes, in the bottom of Belle-Plagne, the most popular part of the station (no metal stairs) because close everything: both the slopes and the heart of the village (50 m) with its shops and its .restaurants. Belle Plagne is a warm, family-friendly, fully pedestrian resort. From the apartment, very nice open view, west facing. Small balcony. 4th floor then 1 flight of stairs. Individual ski locker closed the ground floor. Working bench bed to bed 2 pers. 160 cm + 2 bunk beds. Neat decoration, mountain style. You will ski directly at the bottom of the residence and will be able to go to the Paradiski area or the multiple slopes of La Plagne resorts, all connected to each other. You can photograph your children ESF meeting just under the window. The club piou piou for the little ones is just behind the residence. + In the kitchen: Classic Coffee Nespresso coffee machine +. Moreover, as we usually did not have much time for cooking, you'll find in this studio, in addition to traditional raclette and fondue, a device to croque / snacks / panini for quick meals and a device pancakes / pancakes / blinis for children snack or breakfast. Fridge with a real freezer (not great, but helpful). But the best is when the morning, opening the curtains, you will find the sight that awaits you. The price indicated by Abritel includes the price of the stay, their service charges, the tourist taxes paid to the municipality and a deposit of 400 € refundable automatically by the site at the end of the stay. Finishing cleaning included. Sheets rental possible on request. I also propose another apartment in the residence Pierre de Soleil, next door, if you want a stay coupled with family or friends: see the rental n ° 1680172. You will find the same comfort and the same concern for a neat decoration on the Savoyard theme. Municipal paid parking in the residence. Locker keys closed individual skiing. Electric kettle. + Electric raclette fondue set provided in the apartment. Right on the slope. Awesome view. Close to everything. Cosy and clean with everything you need. Will definitely stay again. Great position at top of village. Enjoyed sitting on balcony which just catches the late afternoon sun in Feb. Comfy beds. Compact but usable bathroom and kitchen. Well kept and clean. Easy ski lockers. Fantastic skiiing and sledding from the door. Hi Mike, those are the concierge's charges for additionnal services - which you can choose or not, as you wish - they are not mine. I am sorry you didn't ask me before, I would have told you their prices . Anyway, I am happy you enjoyed your vacation and liked the appartment ! Ces frais sont ceux de la conciergerie pour des prestations supplémentaires qu'ils proposent, sans obligation. Cela ne dépend pas de moi. Si vous m'aviez demandé avant, je vous aurais donné tous leurs tarifs. Rien n'est obligatoire en tous cas. Heureuse que vous ayez apprécié vos vacances et l'appartement ! 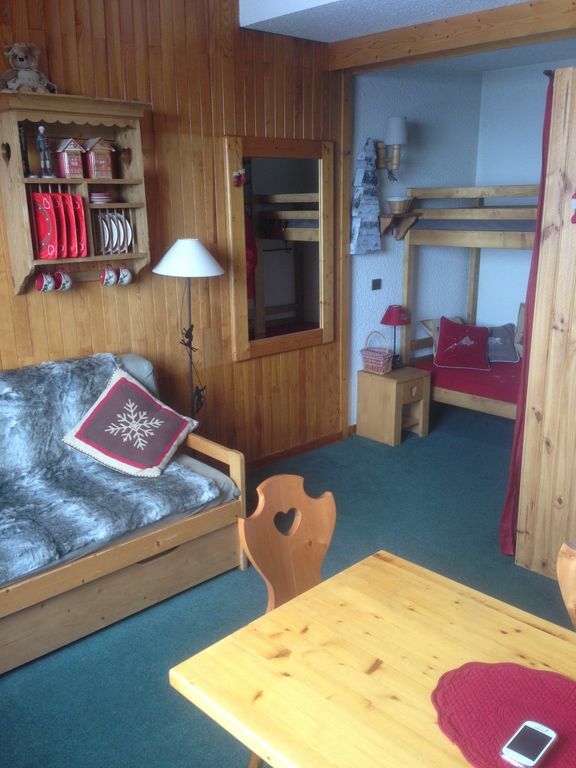 Fabulous apartment, tastefully decorated, ski in/out.. perfect! It has been a real pleasure to welcome you and family , I am happy you enjoyed the appartement and also Belle Plagne. Belle surprise en ouvrant la porte de cet appartement (qui meriterais d’etre mieux mis en valeur par les photos de l’annonce). La déco est adaptée et le coté pratique présent pour ce petit logement, nous étions 3 adultes. Le gros plus c’est sa localisation pied des pistes pour partir ou arriver et à 50 m des commodités spar/bars et restaurants tout en restant dans un environnement calme pour bien dormir. Si prochain sejour à 3 à la plagne il se fera à Belle Plagne et dans ce logement . Gesamteindruck muss sagen war sehr schön wir hatten für eine Woche gebucht! Die Wohnung bietet alles was man braucht außer einen Backofen! Ansonsten das Bad klein aber fein. Küche auch sehr gut ausgestattet. Die Wohnung im oberen Stockwerk bieten eine sehr schöne Aussicht! Séjour très agréable dans ce studio cosy, joliment décoré comme un petit chalet de montagne! Caution de 400€ remboursable dans les 7 jours. Ce tarif s'entend ménage courant fait lors du départ. Touche de finition supplémentaire moyennant un supplément de 30€ sur demande préalable.